Deyshun Deysel the Everest climber flanked by Londeka Ngidi (in Flame of Hope T shirt) and Vivian Awour in July 2007 at Moyo's Zoo Lake. Londeka Ngidi in the swimming pool at no. 58 in October 2008. She hopes for another tissue expander for her scalp. 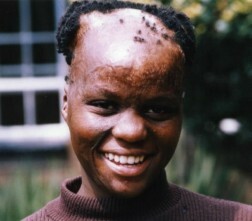 Londeka Ngidi underwent surgery at Sunninghill Hospital on February 10th 2005, when Dr Martin Kelly and anaesthetist Dr David Papendorf inserted her second tissue expander under her scalp. They had performed the same process two years previously. Netcare's Sunninghill Hospital bore the theatre costs and the costs of accommodating Londeka. Londeka turns thirteen on May 8th 2005. She lives in an RDP house in Imbali, Pietermaritzburg, KwaZulu Natal with her aunt Betty, uncle Bongani, grandfather Conrad and four cousins: Siphumelelo, 4, (mother deceased) Thembelihle, 7, (mother Nomusa, missing somewhere in KZN), Lusanda and Asanda, twins aged two (mother Sanelisiwe living with them). No one in the household works. Only Londeka's mother Ntombifuthi works in radiography at Khombe Hospital in Kranskop, beyond Greytown. She returns home at the end of the month only, carrying the wages to feed, clothe, educate and house nine people and herself. 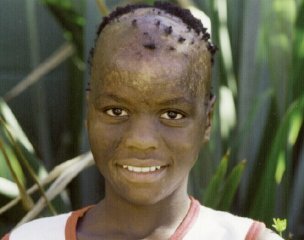 Londeka was burned as an infant, seemingly by pulling a container of boiling water onto herself. She lost much of her hair and severely damaged her right arm. A beautiful softly-spoken girl, she never goes out without a hat to hide under. Londeka doesn't see her own beauty, but she has an inner grace that shines through. She could shave her head and take her place alongside models, but does not have the confidence to do so. 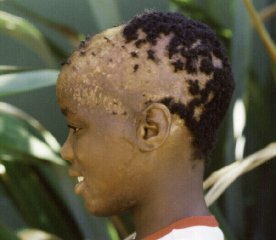 So Children of Fire will continue to help her to achieve her dream of a full head of hair.The tissue expansion process involves placing a balloon-like device between the skull and the scalp, and then injecting saline (salt water) into it week after week. This stretches the hair-bearing skin above, a little like a 'pregnancy' on the head. It does not make more hair, but it makes the existing hair go further. We do not consider this to be cosmetic surgery so much as reconstructive surgery. 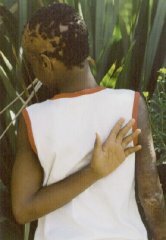 Children need to have a normal hairline, to be able to face the world. We urge the Department of Health to include tissue expansion in general practitioner training so that children like Londeka don't have to travel so far afield for a medical solution, and to have to spend so much time away from home. She might have to stay with Children of Fire for more than four months for a successful expansion. Londeka attends the Johannesburg School for Blind, Low Vision and Multiple Disability Children in Auckland Park while she is receiving treatment and continues with her Grade 8 syllabus there. 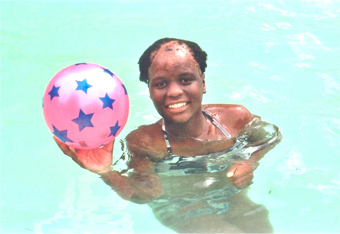 Londeka's primary school and new high school have handled her injuries well and her family is extremely supportive. Unlike most of the children helped by Children of Fire, she has not suffered a great deal of teasing. But she is used to camouflage as well. Wearing a floppy hat everywhere she goes, even though it is not part of school uniform, avoids the stares and comments. Wearing long sleeves avoids people staring at her arm. Her ambition is to be a doctor 'because I want to help other people'.She is good at science and mathematics, and in January 2005 entered Grade 8 and ML Sultan High School in Pietermaritzburg. Her school is mixed demographics with 43 pupils in her class, 18 of them boys. Londeka prefers the gender mix that way so that 'the boys don't get out of hand if we outnumber them'. Londeka has been with Children of Fire for three years now. She has attended the charity's burns camps that take place twice a year, taking part in the many confidence-building exercises and activities ranging from music workshops with international composers to theatre trips, pottery, traditional dancing, South African cookery, environmental outings, reflexology and arts and crafts. She gets on well with all the other children and feels for them, especially our youngest survivor Sizwe. In 2004 Londeka attended Forest Hills Primary School (teacher Miss Tomlinson; best friend Thobeka) near Pietermaritzburg in KwaZulu Natal, and her home is in Imbali township. Her father Sibusiso died some years ago; her stepfather died in February 2003 and her 41 year old mother is not expected to be around when Londeka grows up. But none of this has dimmed Londeka's ambitions. 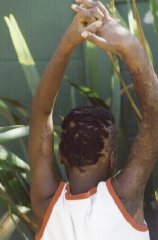 Londeka was patched up quite well at the time of her original injury and has good movement with her damaged arm, though contractures had to be released when she was eight years old. Her damaged arm cannot move as far as her undamaged arm, but the difference is minimal. 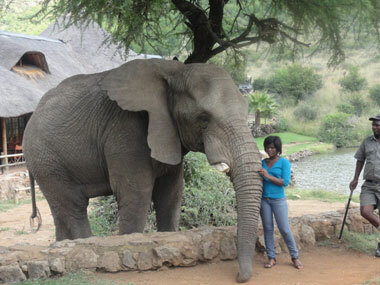 Londeka was also lucky that her face is largely unscathed. But little girls don't like to be bald. 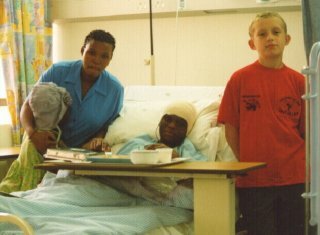 Children of Fire learned about Londeka when the charity helped to arrange for a British maxillofacial prosthetist Colin Haylock to visit South Africa in February 2003 and emailed around the country to charity and medical contacts, to find severe paediatric burns cases in need of his particular skills. Londeka's name was put forward from the Howick area but when charity director Bronwen Jones met her off the bus at dawn one Johannesburg morning, she said: 'I immediately saw that her burns were not bad enough for prosthetics, but I also saw that look of hope in her eyes. I knew we could not send her back without doing something.' 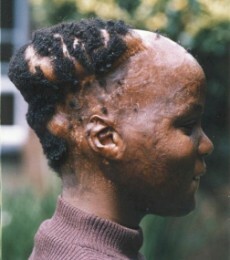 Jones arranged for Londeka to be seen at Johannesburg General Hospital. 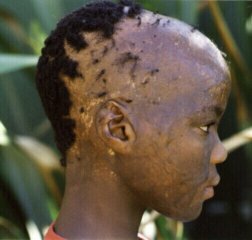 She said: 'I was sad because the reconstructive surgeon there said that there was not enough hair; that Londeka should learn to live with a wig. 'I pleaded that good Afro wigs are hard to find; that they are hot and uncomfortable; and that children can be teased as much wearing a wig as they are teased if they are bald. When it seemed that the state sector would not help, I turned to Netcare's Dr Martin Kelly as I knew that he had helped another badly burned child of a similar age and used a tissue expander very successfully to restore his hairline.' Dr Kelly not only agreed to help, but recognising the seven-day-a-week overload of the charity's schedule, he came and carried out the required scalp measurements on a Sunday morning in an Auckland Park garden. Londeka's treatment costs were all born pro Deo by Sunninghill Hospital. The surgeon and anaesthetist both gave their time for free. The nursing care and general attitude of hospital staff were exemplary. The little girl was prepared for her operation by Children of Fire, so that she understood how a tissue expander works. The expander is installed and then there are injections of saline (salt water) over many months - 100ml at first with a 23 gauge needles or less, and then about 50ml each week. If too big a needle is used, it can damage the valve. About one litre or a little more can be put into 700ml tissue expander until it is stretched to capacity can be taken out and the hair moved. UMashesha visits KZN Children of Fire arranged for a KwaZulu Natal surgeon to undertake the weekly expansions, but his heart was not in it. He undertook 'rapid expansion' which we do not recommend. 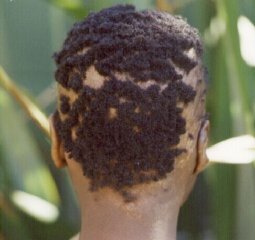 It produced poor results for two children.So Londeka did get extra hair, but not enough. That's why she returned to Johannesburg for medical checkups in 2004 and further surgery in 2005. Londeka was given Grade 6 mathematics on her first visit and Grade 7 material in all subjects on her next long term stay - sourced with the kind assistance of Melpark Primary School.We turned to Greenside High School for support once Londeka needed Grade 8 work.Upon learning about her mother's condition, Londeka was also given information about the immune system and how people with immune deficiency can prolong their lifespan and improve their quality of life. This was worked through to ensure that the complex vocabulary was understood and she was given counselling about what the future holds. For further details on tissue expansion refer to our website sections: Mfundo Ntamehlo and also that on Tissue Expanders. 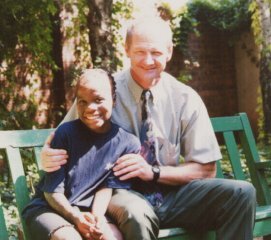 Londeka was accompanied home on several journeys by Thomas Ranamane, National Head of Children of Fire Trust's UMashesha ('quick mover') volunteers, because she was too young to travel alone. His task was to make contact with the fire brigades, hospitals, SAPS, communities at risk and any burned children in need of advice. He explained that Children of Fire was set up as a charity several years ago after its founder took on the care of a six month old baby who lost her entire face and hands in a shack fire. The objectives of the Trust are to assist badly burned children to get the best surgery, therapy and education that is possible and the Trust also seeks to prevent such injuries with a wide-ranging education and prevention campaign. Ranamane said: 'Initially the prevention campaign focused on teaching squatter camp residents basic First Aid, fire fighting and fire prevention skills. As time went on, it became clear that there were other wider aspects of community safety that led directly or indirectly to children being injured - from alcohol and intimidation to illegal electricity connections.' The UMashesha members are bright, committed, well-trained and most of them live in communities at risk. They speak from direct experience of unsafe living conditions. They write their own safety plays, dealing with topics as diverse as the drunken father who kicks over a candle while his children are asleep, locked inside the shack; the epileptic girl whose fit is triggered by flickering flames and her subsequent injuries as she falls in the fire (and the superstition of onlookers who will not pull her out); the explosion of a home-made paraffin stove and its consequences for a community. These plays are put on in whatever language is appropriate to the community, in schools and churches across Gauteng. Mr Ranamane hopes that the idea can take off in KZN as well. He said: 'Our ideas are free for others to copy so long as they credit the source and do not use them for commercial gain. 'The UMashesha also accompany burned children to and from hospital, where their relatives either can't or won't do so. 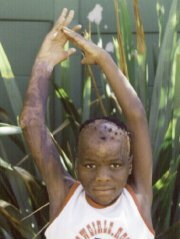 Burns are forever, so a child injured as a toddler may still need reconstructive surgery ten years later. The UMashesha help people after they have lost all their possessions after shack fires, with donated clothes, South African made safe candle holders, sugarcane gel stoves, and anything else that helps the families to get back on their feet again. Children of Fire Trust and the UMashesha receive no money from government at all. Everything is funded from donations - from R10000 for a firefighting water tank to place inside a squatter camp to R1000 to provide occupational therapy sessions to a burned child in a remote area. Ranamane said: 'We act as a friend to the emergency services but, when there is corruption or indolence, we act in a watchdog capacity as well.' Mr Ranamane liaised directly with local doctors when he accompanied Londeka home.Our volunteers visiting KZN have been hosted by Durban fire brigade, Pietermaritzburg fire brigade and once by KZN charity CINDI run by Yvonne Spain. Children of Fire has to help children who lose their bottoms in fires to acquire nappies (about R150 for a pack of 15 for small adult size); Ms Spain has to help people in the final stages of Aids with nappies as well. This unusual link has kept us in contact, even with the UMashesha now using CINDI's posters about plants that assist people with HIV and growing the plants themselves. Dr Siya Mjamekwana at Edendale Hospital near Pietermaritzburg offered in the past to assist with Londeka's needs as well. He was unaware of tissue expanders and the process. A Dr McKerrow at Greys Hospital might also assist. Burned children who come under the care of Children of Fire, never imagine the pleasant surprises that will come their way until they arrive. Londeka was serenaded in September 2003 by a string quartet at her school in Pietermaritzburg because the Sontonga Quartet and Children of Fire link in a variety of initiatives - to uplift, to educate, or just to enjoy. Bongani Madlala in Howick brought a similar musical treat to his school in the same week. Music might seem peripheral to the medical needs of children we help, but anything and everything that can raise their self esteem, make them a hero or an ambassador for a day, is a good thing. People who want to learn more about the quartet should email violinist Marc Uys on sontonga@webmail.co.za Enoch Sontonga was the man who composed South Africa's national anthem. 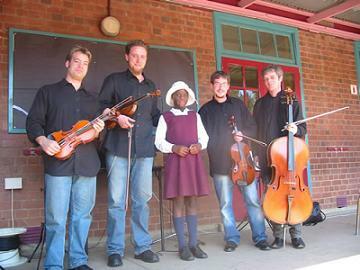 The quartet played in the Joe Slovo squatter camp in Coronationville, Johannesburg, on March 21st 2004. Another first.